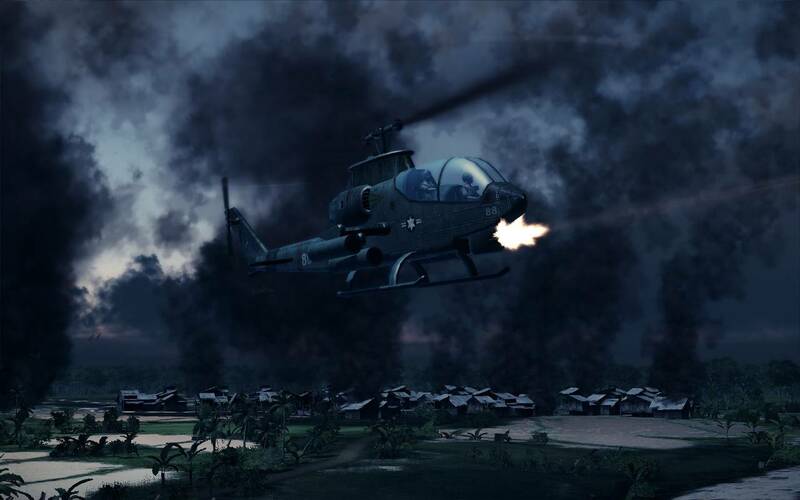 The fourth game in the Air Conflicts series is set to showcase the Vietnam theatre of war, and brings an arsenal of helicopters along for the ride. 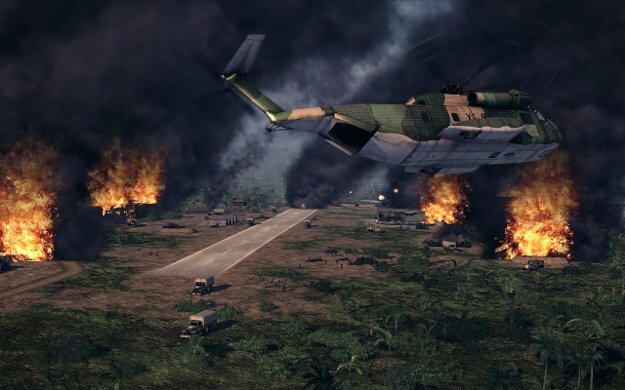 The Vietnam War is a popular theme for war-based shooters, and we've seen a small handful of flight-based games based on the era. 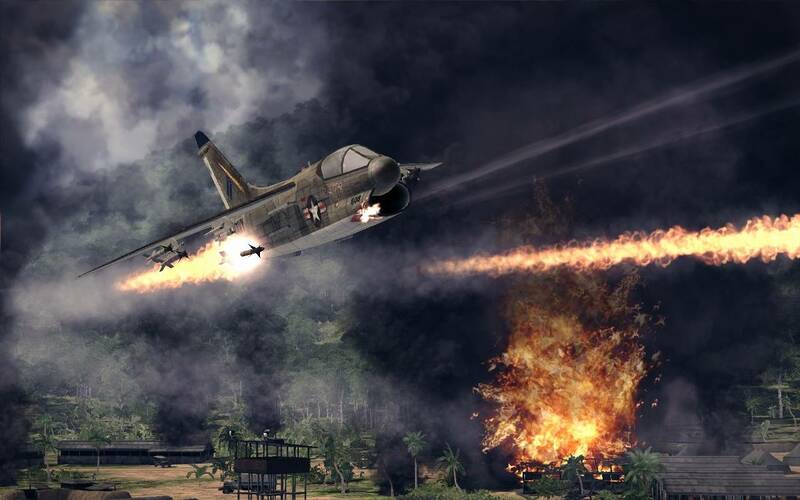 Air Conflicts: Vietnam brings the series to the jungles of Vietnam, and is the fourth game in the Air Conflicts series on consoles; the first two games having taken place in World War I and II, with the third game having highlighting the Pacific Theatre. 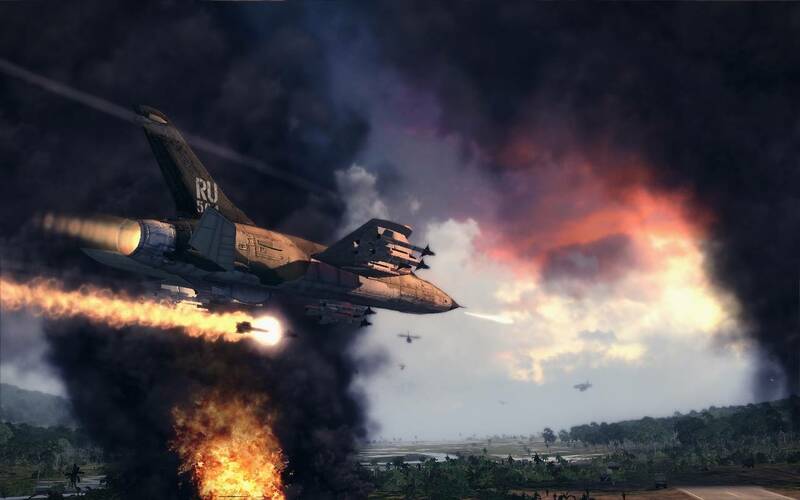 The Vietnam theatre brings a number of new elements to the series, for the first time players will have guided missile technology available to them, as well the introduction of helicopters into the Air Conflicts games. 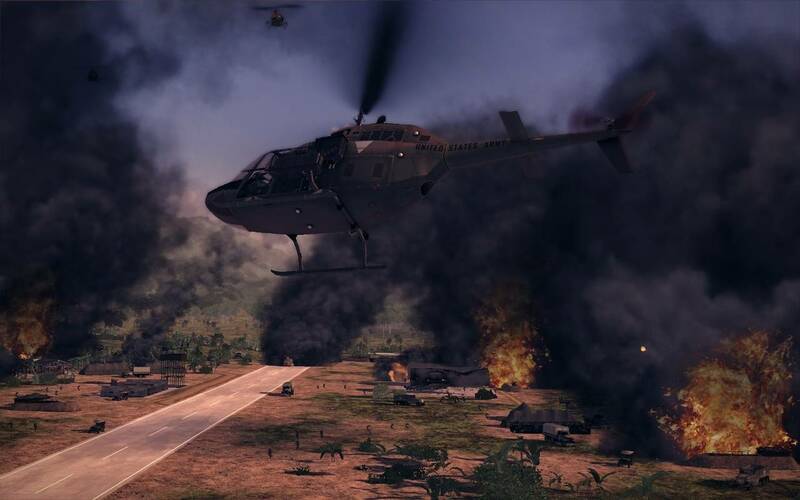 While planes are typically very quick and highly effective at strafing and bombing runs against ground targets, helicopters are much more precise, allowing you to sneak up close and execute precision attacks. They are also highly maneuverable, and allow for new types of missions such as rescues, but are easy targets for ground forces and anti-aircraft weaponry. As with other games in the series, Vietnam will offer a linear single player campaign taking you through the battles of the Vietnam war, and providing a variety of missions to complete. 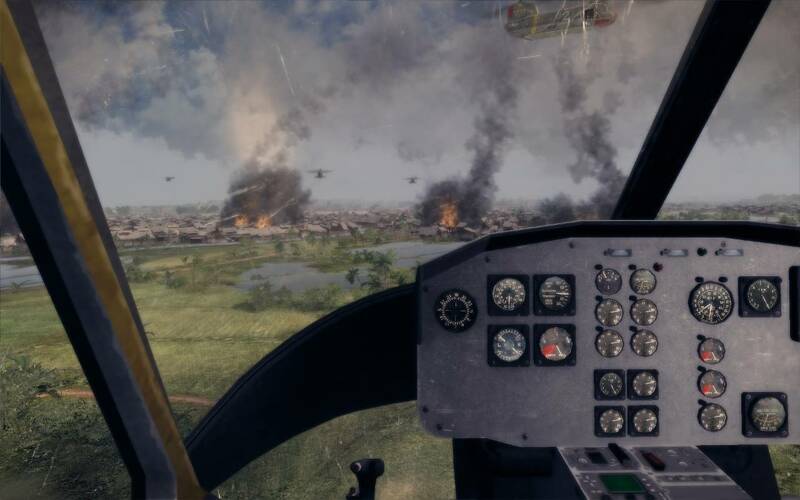 The campaign will offer light RPG-based elements such as stats tracking: how long you've played, number of kills, and buildings destroyed, among others. You'll slowly level up to improve skills such as dogfighting or bombing accuracy, endurance, and evasion. 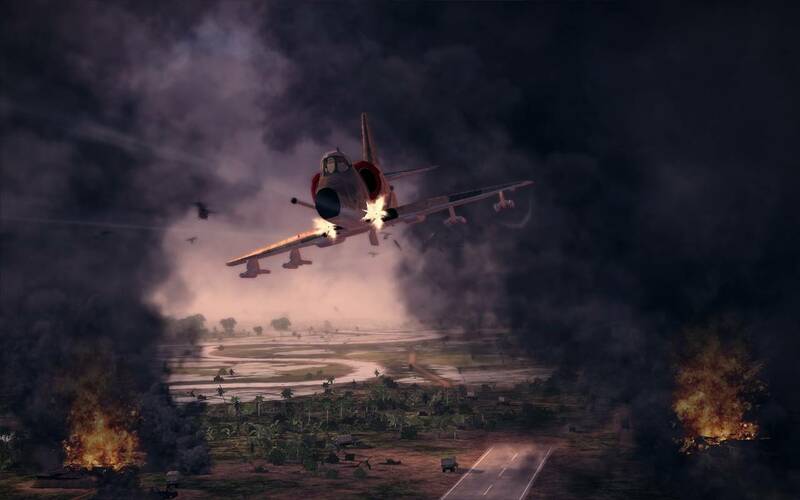 Air Conflicts: Vietnam is primarily a squad based game, and while tactically squads are of little importance (as in you don't really care "who" is in your squad), the fact that they exist has several advantages. 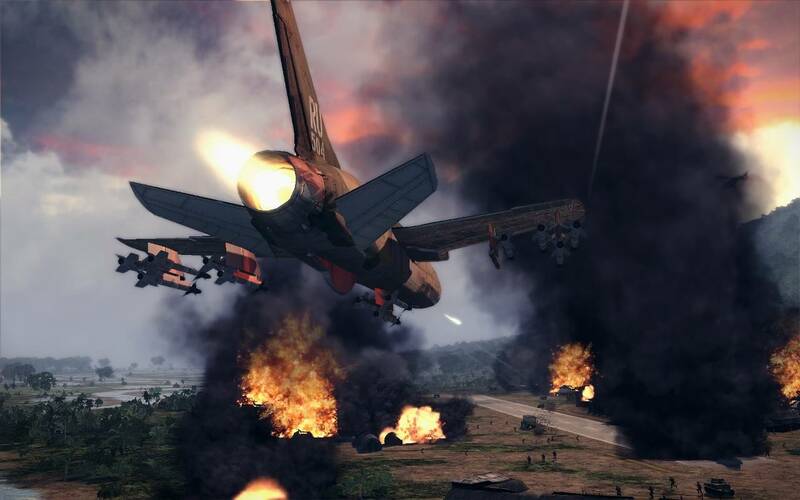 For starters, the game allows you to quickly jump between squad members in-flight, certain members may have unique equipment or munitions to help complete a specific objective, or simply a full complement of bombs of guided missiles. 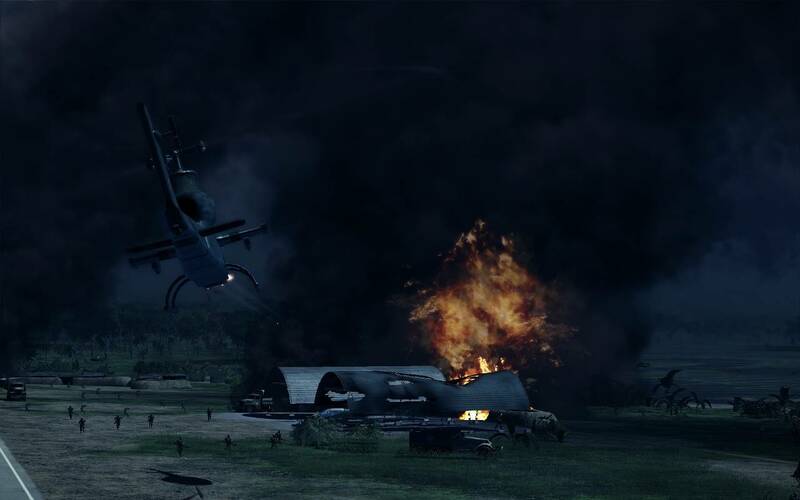 Should a high-level squad mate go MIA during a mission, the game may offer you a chance at rescue via a search and rescue side-mission upon completion. Regardless of how many missions or modes a flight game has to offer, it's ultimately only as good as the underlying flight mechanics and controls. 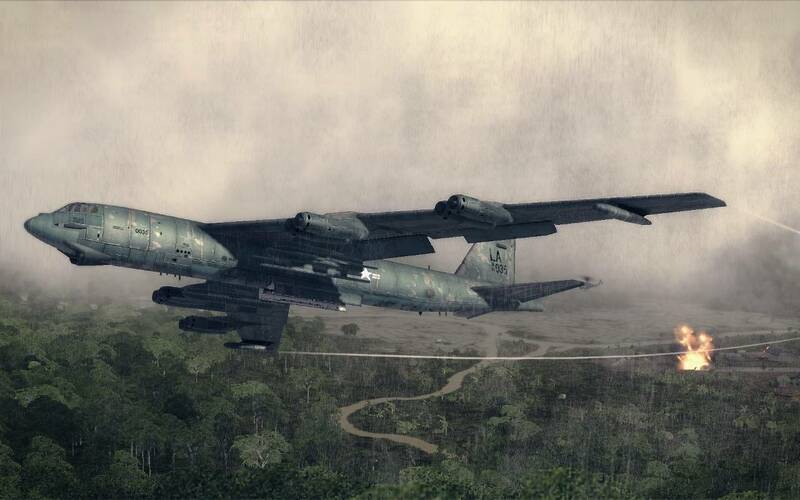 In this respect, Air Conflicts: Vietnam is a mixed bag, and definitely an arcade shooter. 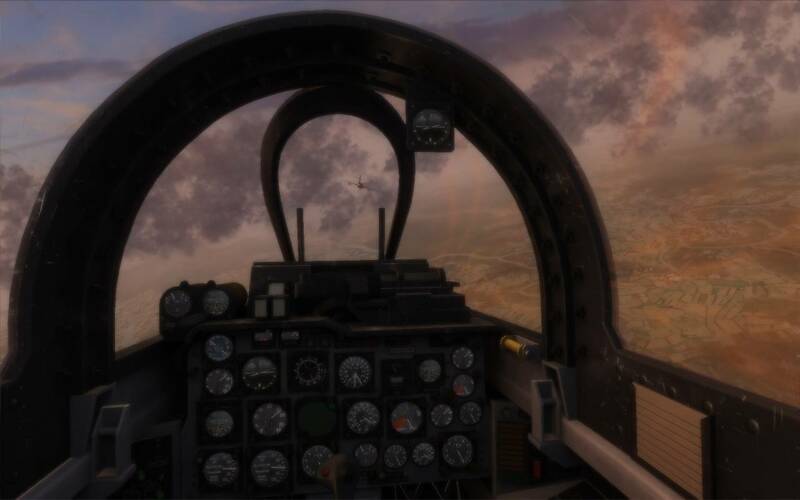 The fixed-wing aircraft feels solid, the controls have clearly been refined over several generations, and the combat and dogfighting feels good. Fixed wing controls are pretty standard with your left stick operating the control surfaces, and the right stick managing camera rotation and positioning. 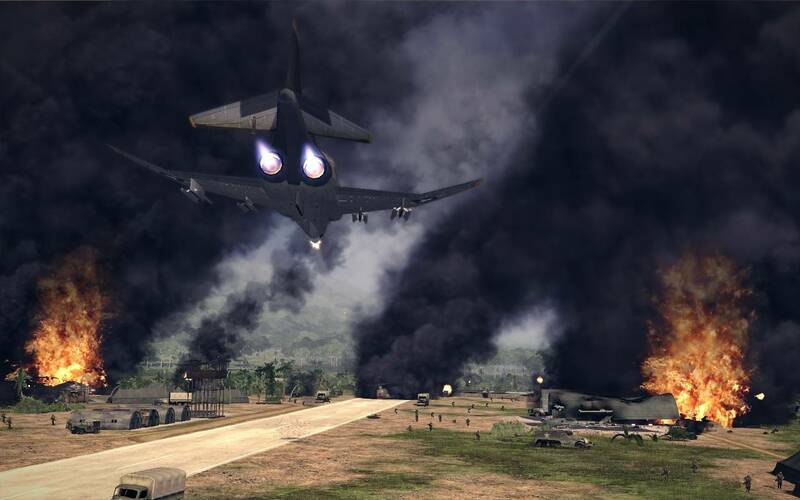 The game also features a few realistic touches, the ability to stall in a high nose-up configuration, as well as afterburners and evasion flares. 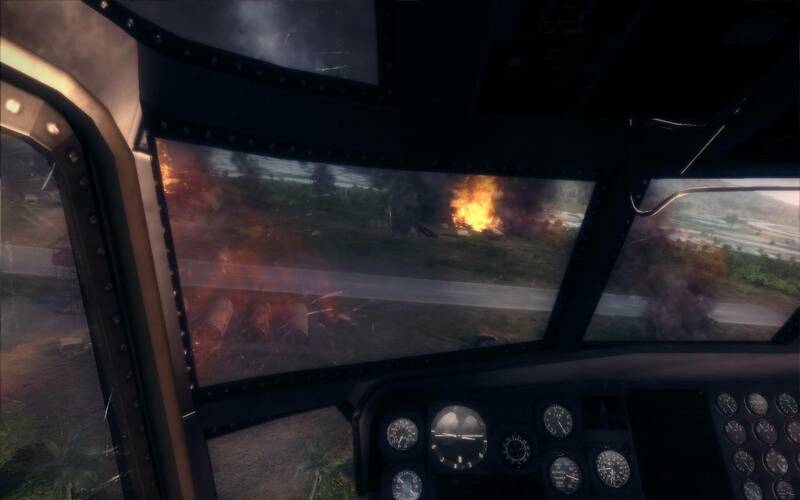 On the other hand, the helicopters are an area I wasn't able to adapt to in the preview build, not necessarily because of the flight model, but the bizarre control scheme. On the choppers, the left stick controls the roll, pitch and yaw, but doesn't actually move the aircraft, that control is delegated to the right stick. It felt really unnatural to be able to pitch the helicopter forward, without it actually moving forward. The thought of the designers was to be able to control and aim your weaponry with the left stick, but the fact that the helicopter moves as well feels unnatural. I would have expected, as in most flight games, the left stick to control the pitch and roll, and the right stick to control the yaw, and because of that I had a really hard time handling the choppers. 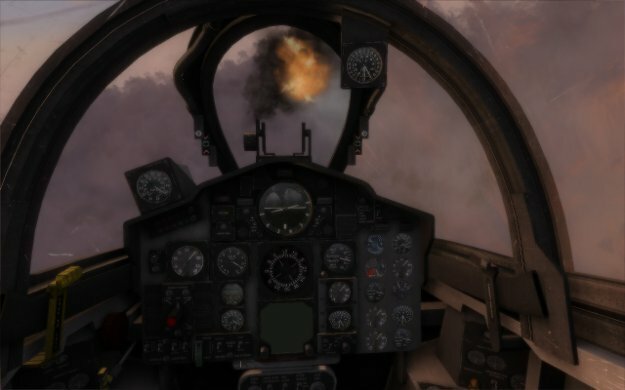 My fellow editors had no problems picking it up, and the demo itself was pretty solid, but as someone who has spent a lot of time with flight simulators, it felt awkward. In my experience with arcade flight games, the best experience is always the multiplayer. 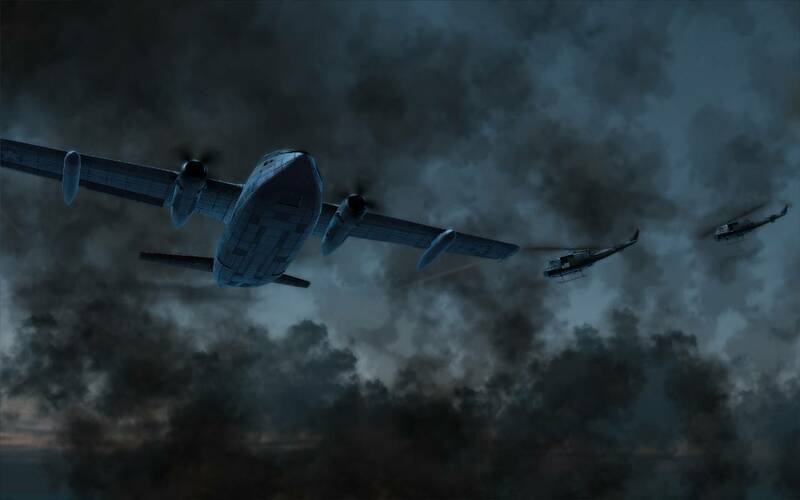 While the campaign is undoubtedly the primary focus of the game, battling it out in the skies against human opponents is always the most entertaining. 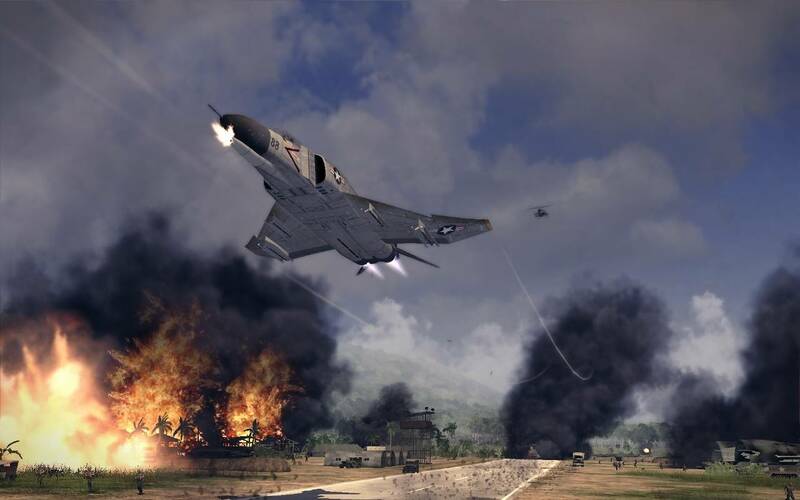 Air Conflicts: Vietnam has several multiplayer modes, free for all, co-operative team play, and capture the flag (via bombing runs). For the most part, the multiplayer is pretty straightforward, pick a map, an aircraft, and your time of day and weather conditions. 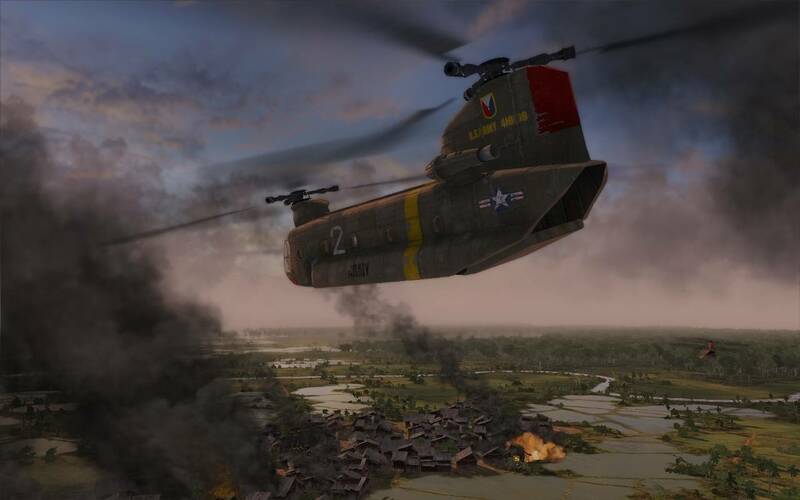 In multiplayer, you can choose from a huge variety of planes, both American and Soviet supplied North Vietnamese birds, including amphibious aircraft, propeller planes, and even utility helicopters (although I'm not sure why you'd want to battle with a utility helicopter). Once you've selected an aircraft, you can choose from a weapons load out, and then dogfight to your hearts content. 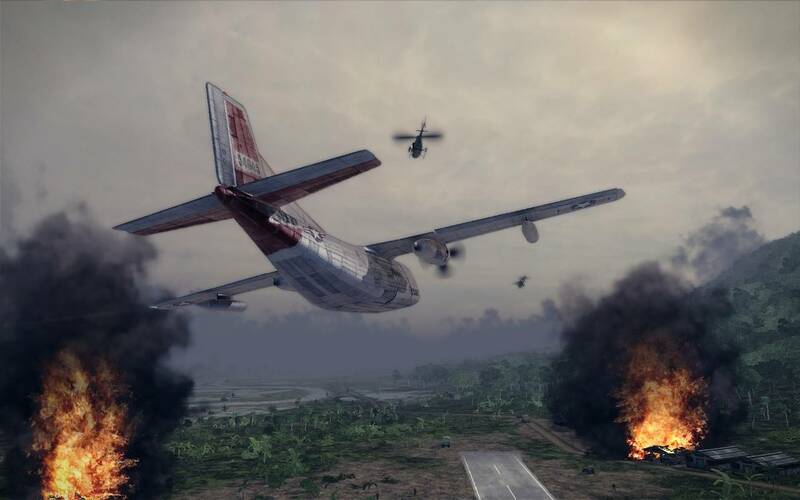 The multiplayer is definitely going to be the highlight of Air Conflicts: Vietnam, but the key to its ultimate success will be a large enough community to sustain a good number of rotating matches and varying opponents. 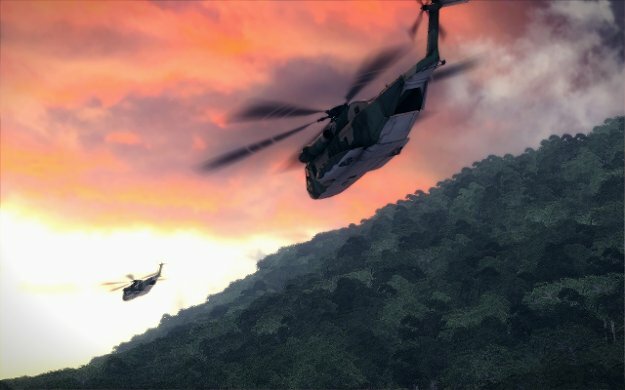 Given this is the fourth game in the series, bitComposer games has had time to refine and polish their game mechanics and flight model over time, and while I may be skeptical about the helicopter controls, the basic flight mechanics of the game are very solid. And while the campaign is the primary focus of the game, the multiplayer is definitely going to be the highlight. 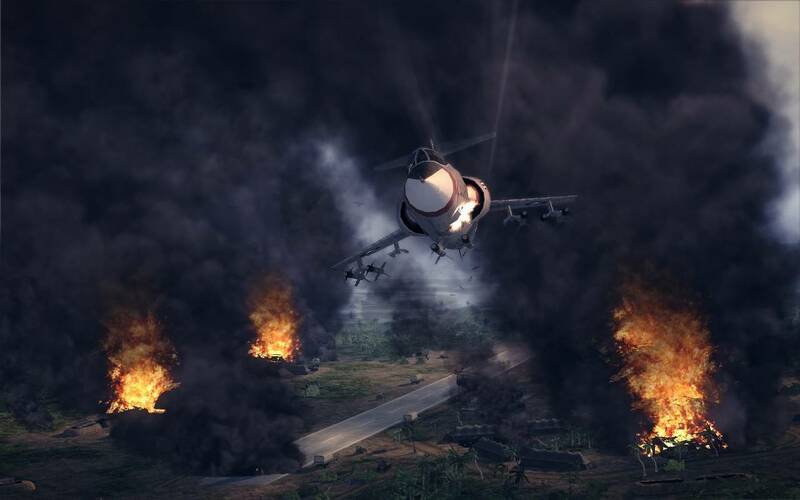 Air Conflicts: Vietnam will be available at a mid-price (in the $40 range), and available in October on the PC, Xbox 360, and PS3.